We are improving our platform continuously. Recently, we have released an important update. It contains four major extensions: We have worked on predicting the decision maker behind cases that got exchanged. We added attorney tabs to each profile. You can now switch between several kinds of dates. And we made searching for partners, clients, and competitors much easier. Who selects the law firms abroad? Client or priority filing law firm? 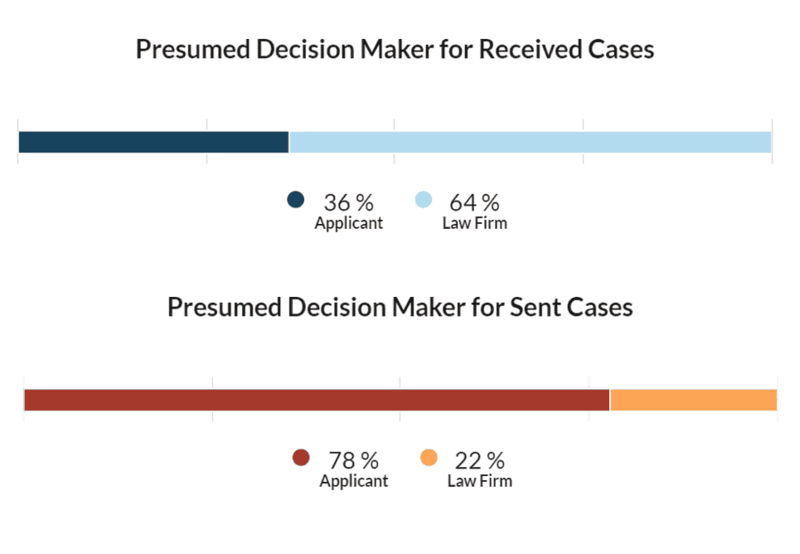 Over the last weeks, we have developed an indicator predicting whether the law firm or the applicant has made the decision about which law firms to contract abroad. You will find it on the case exchange tab of every profile. To some extent you could already analyze this visually in the case flow charts. We now made this an explicit figure for every single case. It lets you understand for which share of the cases a foreign law firm is actually free to choose you as representative of regional/national phase filings. And you can see whether or not a partner actually has the filings he or she pretends to have. We find this a major step. How about you? Who are the attorneys behind a law firm’s filings? For some (but not all) filings there is information available about the attorneys who are responsible for certain filings within the law firms/IP departments. It depends on the jurisdiction and also on the best practice of the law firm. We have added a tab on every profile where you can see the attorneys within the law firm. On applicant profiles, it contains the names of people working on filings for this client (internally as well as externally). So, if you filter for certain clients or a specific attorney, you can now see who works for which client. It gives you an indication who you want to approach within the law firm/IP department for a certain case or client. Since the data cannot be complete, we underestimate the volume an attorney is handling. This feature is beta. Until now, we allocated all patents to a year by using a mix of the filing date and the earliest publication date. For all priority applications and direct filings, we took the application filing date. However, this date is problematic for regional/national phase applications of a PCT. For these applications, offices artificially set the PCT filing date as the filing date of the regional/national application. In these cases, we take the first publication date instead of the filing date because it is much closer to the actual time when an attorney worked on prosecuting the application. Still, when comparing our statistics to other databases, our users sometimes need one or the other. We added a “date switch” feature next to the year selection box. 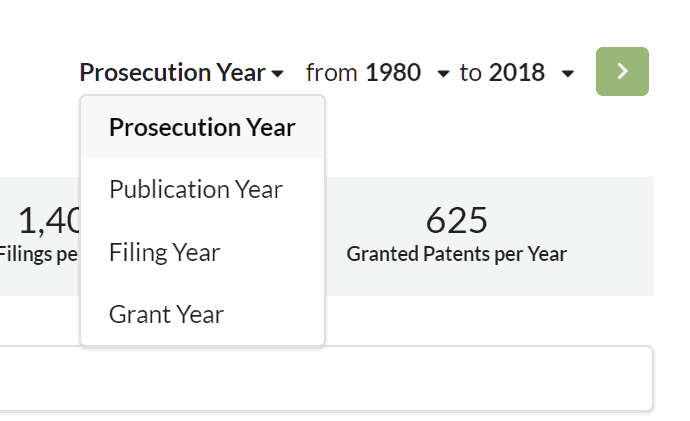 You can also switch to grant year now (of course, for granted patents only). Our mixed date is still used for “Prosecution Year” and remains the standard selection because we believe it is the most correct one. In the past, using our search feature has been quite complex. Maybe you felt a bit overwhelmed by all the criteria you could select. We heard this a couple of times from our users and completely rebuild the search form. It is now a simple sentence that you fill. And when you want to limit the results, just add a constraint. At the same time, every search result now has a stable URL. So you can now save the link of a search result or just share it to your colleagues. Going through millions of documents at once is a rather intense task for our servers. They are very powerful, but still reach their limits for certain queries. In the next step, we are implementing new database technologies to make the search quicker. Once we have this in place, our search functions will also become more flexible with respect to the information we display in the search results.